We have scoured the planet for some top notch Cocktails. We’ve borrowed recipes from as far as New Orleans & New York, as well as adding our own twist to a few classics along the way. Cherry Bakewell £6.50 – Long Devised in 2006 by Mark, who was, for some reason, trying to see if it would be possible to make this famous cake into a drink. Sweet and sour, this has been a Sela best seller for years! Refresher £6.50 – Long Just like the sweet, only boozier! Vanilla Russian £6.50 – Long The Dude’s favorite, with a touch of vanilla. Vanilla Absolut Vodka, Kaluah & Milk. North Star Espresso Martini £7 – Martini Sela is the exclusive outlet in Leeds for Tim Peaks coffee. Absolut Vodka, Kahlua & Tim Peaks Espresso. 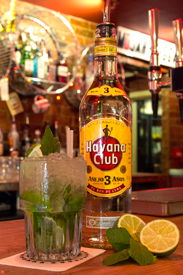 Mojito – £6.50 – Long Havana Club Rum, mint, lime & sugar. Caipirinha £6.50 – Rocks Velho Barreiro Cachaca, lime & sugar. Amaretto Sour £6.50 – Rocks Disaronno & lemon juice. With a cherry on top of course! Coke Float £6.50 – Long Vanilla Absolut or Old J Spiced Rum & Coke. Topped with a ball of ice cream. Peach Teichenne, Southern Comfort & Lemon Iced Tea.